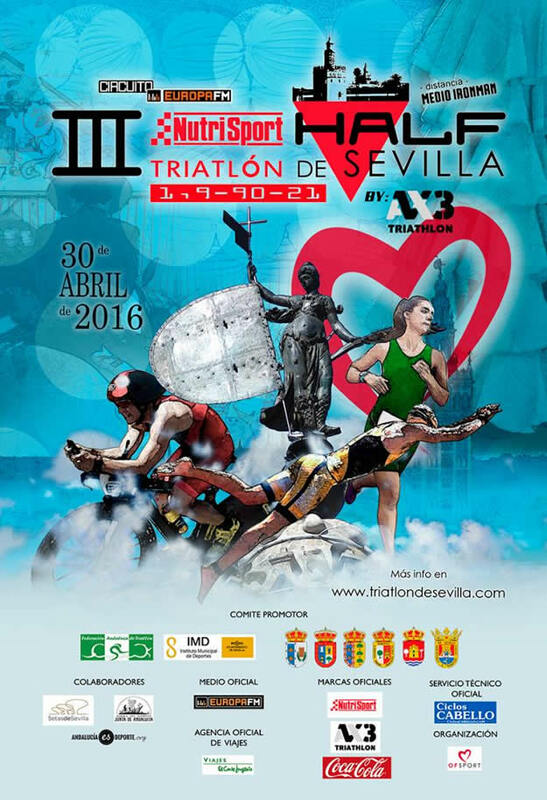 Taking place on Sunday April 23rd 2016 [UPDATE - April 30th 2016], the Half Triathlón de Sevilla (www.triatlonsevilla.com) is the third edition of the half-iron distance (1.9km / 90k / 21.1k) event in Seville, Spain. If you are seeking an early season middle distance option outside of the typical UK weather at the time, and want something away from the more typical Ironman / Challenge options, another contender for you to check out given the easy access from the UK. This feature isn't about the event itself though (you can find out more about that on the race website HERE), but about the event poster that promotes it. While the age of the music download has all but elimited the famed 'cover' artwork from the music world of the likes of the Sgt. Pepper's Lonely Hearts Club Band (The Beatles) and Nevermind (Nirvana), thankfully the digital age hasn't (yet) completely eliminated the promotional poster. The Half Triathlón de Sevilla have put a lot of thought into their design to reflect the history and spirit of the city and the athletes taking part. The result is a design which I'd certainly be wanting to keep and frame as a souvenir if it was a race I'd taken part in. Much like our excellent experience in Bahrain in 2014 and the effort taking there in the design of their medal, an organisation that puts that much thought into the 'spirit' of its race, is likely going to deliver a great experience on race day. Check out the poster below along with the explanation of the artwork inspiration. The design of this poster has been created taking care of every single detail, always paying maximum attention to our city: Seville, and you: triathletes - the main stars of our event. Color: blue, symbolizes the color of infinite, dreams, and wonder. The dream about crossing the finish line and attain glory. Athletes: both male and female, it defines our gender equity philosophy always present during our events. And of course, it symbolizes middle distance triathlon: swim, bike and run. Monuments of our city: La Giralda. A World Heritage site since 1987, one of the most visited monuments in the world and the highest tower in Spain during many centuries. It keeps a strong connection with our athletes, an inscription on the tower reads: TURRIS FORTISSIMA "the strongest tower” like all of you, strong athletes. And of course Giralda's wind vane Giraldillo, the city symbol for victory. Celebrations: As it could be expected, on the background, the most traditional festival of our city: Feria de Abril, a party festival with nearly 170 years of history. Since this year it will commence the week before the race, we could not help but pay tribute to the festival's most emblematic icons. As we know, sport alone does not make an event, a weekend is quite long, and Seville is huge to visit. This is our poster's result, one particular day and an hour. You know that an image does not come out of nowhere, everything has a meaning, and we want to share that with you. Thank you folks, we'll meet on April 30th.